There’s a lot to think about when you decide to add a new dog to your family. You must consider your new dog’s size, temperament and energy level, and you probably want to go with a breed that you find attractive and endearing. But while most dedicated and thoughtful dog owners consider these types of characteristics carefully when choosing a dog, they often fail to think about a few other important factors, such as the amount of hair the dog will shed. Although, if you’re reading this article, you’re likely factoring dog shedding into your decision process and looking for big dogs that don’t shed. We’ve got you covered! If shed dog hair frustrates you or makes you a miserable, sneezing mess, you’ll want to try to pick a low shedding dog breed. This is especially important for those who want to add a large breed to their family, as big dogs produce more hair than smaller dogs because they simply have more hair follicles. While it’s important to note all dogs actually shed (we’ll cover that later), fortunately, there are several great big dogs that don’t shed (very much). Despite their curly and comical coats, poodles are very light shedders, who usually show up on most “hypoallergenic” dog lists. In fact, they’ve been crossed with golden retrievers and Labrador retrievers to create dogs with the personality of a retriever with the low-shed coat of the poodle. Poodles are smart, loyal and loving with their owners, and they are surprisingly effective as guard dogs. Afghan hounds are elegant and graceful dogs, with long, silky hair and a gentle personality. Originally developed to hunt small game, Afghans are very quick on their feet and they have very sharp eyesight to help them locate their quarry at a distance. Although Afghan hounds do not shed very much, they do require regular grooming to keep their coat in good condition and looking its best. Like most other schnauzers, giant schnauzers shed very little, despite their thick, dense fur. Giant Schnauzers are intelligent, loving companions, but they can be stubborn and headstrong. This makes them a poor choice for most novices; they need a calm, confident owner who can exude leadership in a way the dog will understand. 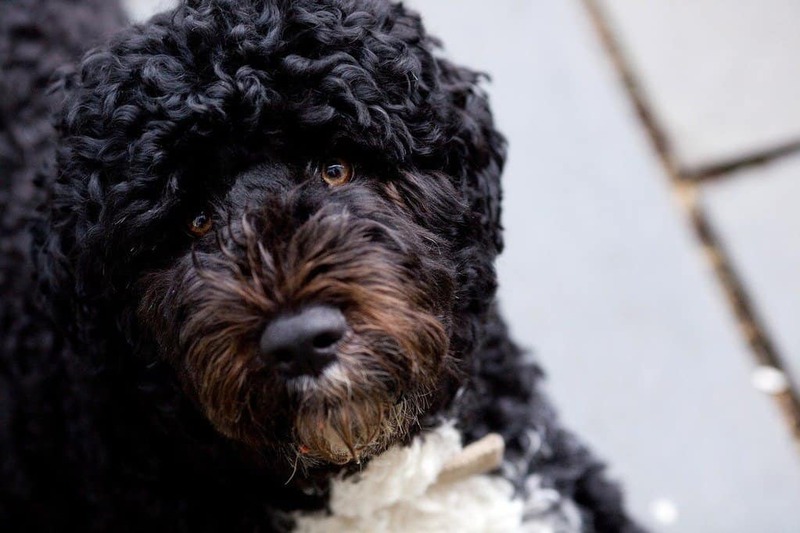 Portuguese water dogs are friendly, happy-go-lucky dogs who are bursting with energy. They make excellent companions for older kids and they generally get along with most people they meet. However, they are not well-suited for couch-potato families, who spend most of their time on the couch. These dogs want to get out and go for walks, play fetch or swim – their favorite activity. Although some people may not consider Irish water spaniels “large,” big males often approach 70 pounds in weight, which is certainly not “small.” Irish water spaniels are goofy, fun-loving and comical, and they serve as non-stop entertainment for their families. As their name implies, these dogs love to swim, and you’ll want to make sure you give yours plenty of opportunities to do so. The Komondor has an unusual coat, comprised of long “cords” or hair that bear a passing resemblance to dreadlocks. Dedicated, brave and intelligent, Komondors were originally developed as watchdogs (their long, white coat helped to make the sheep they were tasked with guarding more comfortable). Komondors are low shedding large dogs, and you won’t need to brush them, but Komondors do require regular coat care to keep their cords clean and healthy. Komondors require a strong, assertive leader and plenty of socialization to prevent aggression. Another breed that could be considered “large” or “medium,” depending on your own criteria regarding size, Airedale Terriers are friendly, affectionate and playful dogs, who require large amounts of exercise to remain healthy and happy. But while Airedales love their families and bond strongly with their owners, they are a bit of a stubborn breed, who tend to remain slightly independent throughout their lives. Belgian Malinois vary a good bit in size, and some individuals will remain in the 40- to 50-pound range, while others may exceed 80 pounds. Nevertheless, thanks to their intensity, bravery and assertive demeanor, they certainly give the impression of being a big dog. Malinois are low shedding dogs and they aren’t known to drool excessively, making them a great choice for allergy sufferers. However, Belgian Malinois are absolutely inappropriate for novices, as they require a firm, confident leader, who will train and socialize them properly. Some owners view dog shedding as nothing more than a minor inconvenience, but others find it absolutely maddening. Large amounts of dog hair shed can coat everything you own and ruin the aesthetics of your furniture, curtains and clothing. If the problem gets bad enough, you’ll surely see tumbleweed-like clumps of hair rolling across your floors. But while these problems are annoying, they aren’t as bad as those experienced by owners with dog allergies. In itself, dog hair shedding won’t trigger allergies – it is actually the saliva and dander clinging to the shed hair that cause sniffling noses and watering eyes. When your big dog’s shed hair starts floating around your home, it can bring you into more regular contact with the problematic proteins that trigger allergies, which will keep you pretty miserable. Because dog shedding can be so infuriating, many owners set out to purchase non-shedding large dogs. Breeders often call these dogs “hypoallergenic” and explain that they do not shed hair. But while this would certainly be a desirable trait, the hypoallergenic label is misleading. All dogs – in fact, all animals – shed dead skin cells and the vast majority of the hair or feathers they possess (although specialized hairs like whiskers may be retained). This is a biological imperative – as skin and hair cells wear out and begin to break down, they are jettisoned to make room for new ones. Snakes, insects, and crustaceans are famous for doing this in dramatic fashion at discrete times, but mammals (including you) shed in tiny amounts, more-or-less continuously. However, this does not mean that all dogs shed in similar quantities; some dogs are heavier shedders than others are. READ MORE: Do Labs Shed? How Much and When? So, while all dogs shed hair and produce proteins that can trigger allergies, there are a few breeds that are better suited for allergy sufferers and those who want to keep their homes relatively free of dog fur than others are. You can certainly reduce the amount of shed dog hair in your home by selecting one of the breeds mentioned above, but you can also take a number of steps to help keep your home as hair-free as possible. 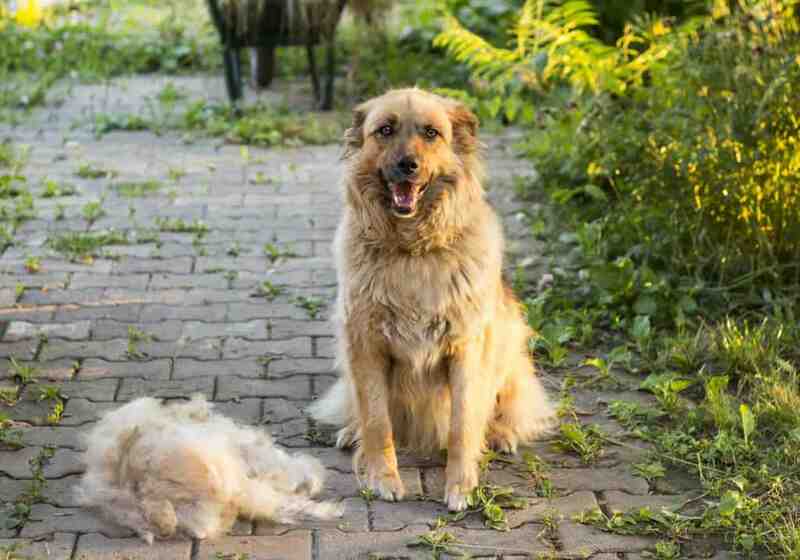 Brush your dog regularly to remove shed hairs before they fall off. If you simply make a habit of brushing your dog outside about once or twice per week, you’ll surely notice a decrease in the amount of hair in your home. This is especially important during the spring and fall when many dogs shed heavily. Bathe your dog frequently to help wash off excess fur. Every time you bathe your dog, you’ll end up removing countless hairs before they have a chance to end up on your floor. Just be sure not to bathe your dog too frequently, as this can cause coat problems that may actually cause an increase in shedding. One bath a month is generally sufficient. Check out our guide to the best dog shampoos for shedding for some specific recommendations. Feed your dog a nutritious diet to help support hair-follicle health. A diet rich in omega-3 fatty acids will help keep your dog’s skin and coat healthy, and it will generally reduce the amount of shedding your dog exhibits. Look for ingredients like flaxseed, salmon and fish oil – all of which are rich in omega-3s — on the ingredient label of your dog’s food. Take your dog swimming as much as possible. Like bathing, swimming helps to wash away excess hair before it can fall out. And because your dog will usually be swimming in a lake or pool, rather than your bathtub, you won’t have to clean up a mess afterward. Have your dog groomed regularly. While some dogs can go their whole lives without ever needing to be groomed, others – including poodles, Komondors and Afghan hounds, among others – must be groomed regularly to keep their coat healthy. By doing so, you’ll help reduce the amount of hair your dog sheds, and you’ll also sidestep the cleanup process, as the hair will end up on the floor of your groomer’s office, rather than your home. Treat any hair or skin problems promptly. Skin allergies, ringworm, mites and other health problems can cause your dog’s skin to become dry and damaged, and it can increase the amount of hair your dog sheds. Accordingly, you should always visit the vet at the first sign of a skin or coat problem. Do you own a large hypoallergenic dog that is low shedding? What about the opposite? Have you ever owned a dog that buried you under a pile of shed fur? We’d love to hear about your experiences, including the things you did to help keep your dog’s shed hair to a minimum. Let us know all about it in the comments below. Golden Retriever vs Labrador: What Are The Differences?